For us now, it is a matter of aesthetic concern....a dancer should think: ....to smile or not to smile. Dear dancers, I can see you already smiling or laughing at this unusual proposition. Believe me, I am serious. I have been serious about dancers and their smiles on stage for a long time. I recall distinctly two things. One, when I was doing full scale performances at age eight, my mother used to say, "Why don't you smile more often?" Two, fast forward to age 23. Guru Ellappa while teaching Sankeerna Alarippu said, "Konjam sirittha mukama irukkanum" (your face should sport a gentle/ subtle smile). That was the only time he ever asked me to smile. I built up my variety of smiles over time, depending on the dance, the song, the nayika, etc. But the words of my guru implying subtlety was engraved in my mind. There was a dancer who performed in the American Cultural Centre as a warm up to her US tour (she was quite famous). I was taken aback by her rather sudden and alarming grins onstage. The aggressive expression sort of gelled with her nritta. Her fans ...beamed in approval. But it was not my cup of tea. Another old timer did not smile much during her performances. But when she did, it suited her. What is more, her betel leaf stained teeth looked sparkling white. Hmmmm...I found out that she had used what is known as tooth paint from America. How clever! Kutti dancers in their arangetram look nice smiling. They are happy! Let them be, even if some of the smiles are caused by anxiety over executing very tough thirmanams which the teacher insists on, to show his or her skills. What about inappropriate smiles by senior dancers? This happens very often in nritta. Once the habit sets in, it is difficult to shake it off. There are of course smiles and smiles. Some dancers have nice teeth. So they think they must show it off often. The downside is when dancers don't have nice teeth or rather large teeth, and they still want to show it off. I have seen pretty girls on stage who literally spoil the look by grinning. I saw a senior dancer interpreting happiness by displaying an awkward smile which was pushed to one side of the face ...screwed up her cheeks too, and on the whole not flattering to her looks at all. In abhinaya, there are many opportunities to smile. Depending on the context, of course. No use studying one hundred old texts in Sanskrit.... they just don't tell you how you should smile, assuming of course, that the art of dance requires some amount of smiling. In a dance drama for example, the characters are well defined and can smile as the situation requires. Not so in the essential solo dance discipline. Take vatsalya bhava. One plays mother to....of course baby Krishna....and one has to use many types of smiling in the course of a single song. Dear dancers....lot of thinking goes into this, understand! The infant in the cradle needs a particular smile...actually he does not need it but you need to show your joy at seeing him (maybe he is giving a baby smile) and the audience easily identifies with this mood of joy. Smiling at this point is quite easy. The problem arises when Krishna is all over the place and the song is going on about his pranks and you have to smile. Practice.... that is what you need to do. There is a mock smile....with pursed lips when as mother Yashoda, the dancer is exasperated with the naughty child, but yet she has to put up a smile of suppressed irritation. Then there is the other end of the spectrum when the mother has to smile in awe when she realizes this is no ordinary child but the Lord of the Universe! In between are many other types of smiles....the mood varies from impatience to amusement to surprise and wonder. Why smile at all you might ask....well, the mother of a divine child should show that she is blessed to be his mother (enna thavam seydhalo!). And she is an active participant in his funny pranks. The gopis when taunted show anger, disgust etc. But even they eventually have to smile at the chubby butter eating child. And no child, as you all know, is going to be attracted to a serious faced mother. In sringara or love situations, one has to be careful in understanding where and how one must smile. Subdued smiling at the beloved is more or less mandatory. Shy smiling, an absolute must at first encounter! In the presence of the beloved, fussing over him, trying to please him and all that, (this is no drudgery...this is willful pampering) needs shades of affectionate smiles, when the eyes light up, and the face as a whole is expressing joy. Please don't equate this with real life situations. Situations demand certain smiles. Take for example, the sarcasm inherent in the songs expressing the kanditha nayika. Such situations must be studied carefully and interpreted. Similarly with Ninda Sthuthi songs. There is wit and humour in the lyrics and the dancer must study the text, and the sub text, and interpret it intelligently. The complexities begin when the song demands a series of expressions to show a conversation with a lover. Think....and evolve some ideas. You can smile with your eyes! Also, without actually showing your teeth. As for more explicit smiles with the lips apart... hmmmm, you have to see yourself in a mirror to check whether this is nice. There is also the bhakti smile...you are depicting perhaps having a vision of the Lord. As a devotee you become joyous. This is a smile akin to tears of joy. Excessive emotion at this point can mar your face, and your smile can either be cloying or plain ugly. Restraint is better. Show emotion with your body and bhakti with a subdued smile. That is my advice! The problem really is that on stage you cannot think too fast. It is here that practice is useful so that some spontaneous smiles can be registered in performance. As Birju Maharaj says....practice with your mind and heart! You may forget your smile. But the audience is likely to remember it! 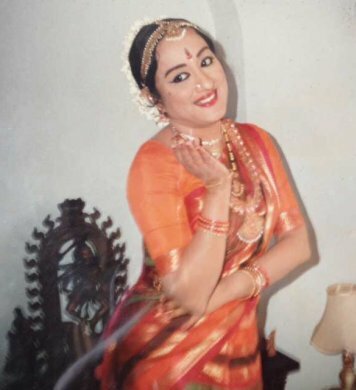 Lakshmi Vishwanathan, a prime disciple of Guru Kanjeevaram Elappa Pillai, is an exponent of the Thanjavur style of Bharatanatyam. She is also a trained vocalist. 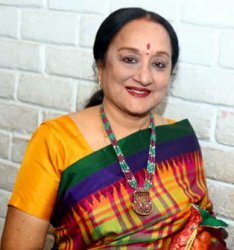 She is the author of several acclaimed books: Bharatanatyam - the Tamil Heritage, Kunjamma - Ode to a Nightingale, Kapaleeswara Temple, Women of Pride -The Devadasi Heritage. Her film 'The Poetry of Dance' was commissioned by the Festival of India. The Mamallapuram Dance Festival started in 1991 was Lakshmi's brainchild. She has served on several arts committees. She is the editor of Kalakshetra Journal.